It’s like that you’ve heard about the amazing benefits that probiotics can offer; in fact, you may be taking some yourself. But did you know that humans aren’t the only species that can benefit from probiotics? Man’s best friend can, too! If you’re looking to improve the overall health and well being of your furry family member, you might want to consider adding probiotics to his diet. These supplements contain tons of healthy bacteria for the gut, and when consumed on a regular basis, they can do wonders for your dog’s health. You don’t want to give your dog just any supplement, though; you want to choose the best probiotics for dogs possible. With the help of a panel of veterinarians, we’ve put together a list of the top five dog probiotics currently on the market. Now that you’ve had a look at our picks for the best probiotics for dogs, let’s examine each one a little bit closer. Below, we offer a detailed summary of each product, including the benefits they offer and what we like about them so that you can make the best choice for your pup. Once you’ve decide on a dog probiotic that you’d like to use, click on the buttons so you can find the best prices on Chewy and Amazon. Purina Fortiflora Canine Nutritional Supplement Box is designed to help support your dog’s digestive tract and maintain a healthy immune system. This dog probiotic is comprised of active live cultures, which help to regulate a healthy balance of gut flora. This product is also fortified with other vital nutrients, including vitamin A, vitamin C, vitamin E, and antioxidants. 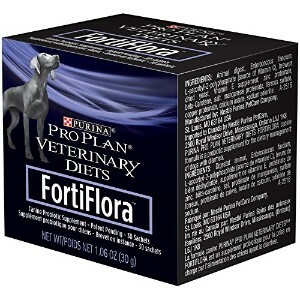 Purina’s Floriflora probiotic for dogs is powered, which makes it easy to give this healthful supplement to your pooch. Just open up a package and sprinkle it right onto his dog food. The taste is supposed to be mild, so it should be easily disguised, especially if you are feeding your pup a high-quality food, like Purina dog food or Blue Buffalo dog food. This product is available in three different options: 30, 90, and 180 pouches, and each pouch contains 30 grams of premium probiotics. Purina’s Fortiflora Canine Nutritional Supplement is made in the USA and adheres to strict regulations. It’s also highly recommended by veterinarians; including the vets on the panel that we assembled. Conclusion: If you are looking to improve the health and well being of your pup with a high-quality dog probiotic that’s made by one of the most reputable manufacturers of dog food, Purina’s Fortiflora is an excellent option to consider. Proviable DC for Cats and Dogs was once only available for purchase from veterinarians, but because it is so effective, it’s now being sold elsewhere, including Amazon. 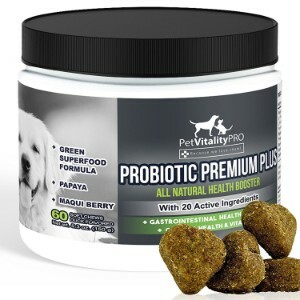 This dog probiotic is comprised of several different species and billions of beneficial naturally occurring microorganisms and active live cultures. In total, there are seven probiotics in this formula, which include enterococcus faecium, bifidobacerium bifidum, and enterococcus thermophiles. 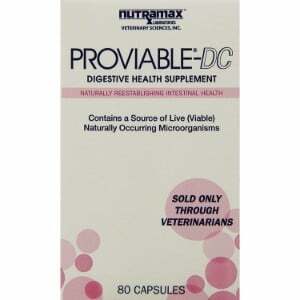 The makers of Proviable DC for Cats and Dogs also added two prebiotics into their formula to ensure that the probiotics are able to survive as they make their way through the digestive acids in your dog’s stomach. In other words, when you give your pup this supplement, you can be sure that he will be receiving the powerful nutritional benefits that it offers. This probiotic for dogs comes is made into capsules. You can give a capsule directly to your dog, or if he’s picky about his food, you can wrap one up in a dog treat or open up a capsule and sprinkle the powder into his food to disguise the flavor. However you choose to give this probiotic to your dog, you can expect to see an improvement in his overall digestive health. Users have reported that it is particularly beneficial for pups who are suffering from a case of diarrhea and that it offers fast results. Conclusion: For a high-quality probiotic for dogs, Proviable DC for Cats and Dogs is an excellent option to consider. It naturally improves the intestinal health and offers fast results. Thomas Labs is a highly reputable manufacturer of various health products that are specifically designed for pets, including dental, eye and ear, joint health supplements, and puppy milk replacers. Their Total Digest Digestive Enzyme and Probiotic Formula for Dogs and Cats contains digestive enzymes that aim to enhance digestion, leading to the efficient absorption of the vital nutrients your furry friend needs to thrive. Some of the ingredients featured in this probiotic for dogs include cellulose, Bromelain that has been sourced from pinapples, alpha-Galactosidase, Glucoamylase, and Lipase. This formula introduces healthy bacteria into your pup’s gastrointestinal tract, thereby improving his digestion and enhancing the absorption of all vitamins, minerals, and other essential nutrients. Offered in combination with a premium-quality dog food, such as a dog food for sensitive stomachs or a grain free dog food, this probiotic can help to ease any tummy troubles your four-legged pal has been having. It will also help to strengthen his immune system so that he is better able to fight of infections, improve the health of his skin and coat, increase his energy levels, and even help him maintain a healthy weight. In other words, this probiotic can drastically improve your pet’s overall health and well-being. According to the reviews that we read, most of the pet parents who have used this product are very satisfied with the results. Final Verdict: Overall, we were very impressed with Thomas Labs Total Digest: Digestive Enzyme and Probiotic Formula for Dogs and Cats. It yielded effective results and was very easy to use. Buy it on their website or through the below button to Amazon. Next up on our list of the top dog probiotics comes from Pet Ultimates. This supplement contains the highest quality live active cultures; 22 different species, to be exact. 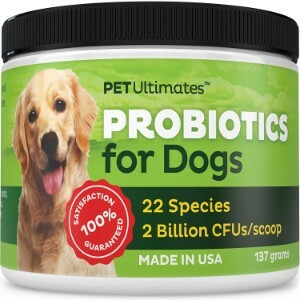 A single scoop of this probiotic will provide your dog with 2 billion CFUs! Now that’s pretty impressive! This product is all natural; it doesn’t contain any of the “bad stuff” that other probiotics contain, such as sugar, grain maltodextrins, or other additives that are not only difficult to digest, but can also have adverse effects on the health of your pup. Pet Ultimates Probiotics for Dogs comes is a powder, which makes it easy to dispense. The powder has absolutely no tastes and you can easily mix it into your dog’s food without him ever being the wiser. Whether you have a super picky West Highland White Terrier, a Mastiff, a Cocker Spaniel, or even a pure-bred mutt, you can be sure that your pooch will take this probiotic down without any issues. This formula is custom made; the 22 species of probiotics that it contains have been hand-selected to ensure ultimate health for your pup. It also contains enzymes that treat gassiness. It’s highly effective; users have reported that they have noticed a marked different in their dogs’ digestive health just a few days after they started giving them this probiotic for dogs. This product is made in the USA and adheres to strict regulations. It’s also backed by a money-back guarantee. If, for any reason, you are not completely satisfied, simply contact the manufacturer and they will fully refund your money without any questions asked. You don’t even have to send them back the unused portion of the product! Conclusion: Other than the few complaints that some users made about it not working for their dogs, which we chalk up to the fact that not all probiotics are going to be effective for all dogs, we think that Pet Ultimates Probiotics for Dogs is a great choice for your dog’s health. And, if you’re not happy with the results, you can return the product for a full refund, which is an added bonus. If you’re looking for a high quality probiotic for dogs that won’t break the bank, than we strongly recommend PetVitality Probiotics for Dogs with Natural Digestive Enzymes. This product offers everything your pup will need to successfully improve his digestive health and enhance the function of his immune system. The price is extremely affordable as compared to other dog probiotics, but the quality is amazing. In fact, the makers claim that it’s the highest potency probiotics / prebiotics formula for dogs on the market! This formula contains a blend of the healthiest probiotics and prebiotics to improve his overall health and well being. It offers natural digestive enzymes, essential minerals, antioxidants, bioavailable vitamins, and phytonutrients to support your pup’s immune system so that he can more effectively fight off infections and properly digest the nutrients provided by his high-quality dog food (such as Taste of the Wild Dog Food). This dog probiotic also helps to ease complications that are associated with allergies and improves the health of the skin and coat. So if you have a breed that is prone to allergies, such as a German Shepherd, a German Short Haired Pointer, or a Golden Retriever, than this probiotic can may be able to provide him with relief. Users have reported that they are very pleased with the results that this product offers. They noted that they saw a marked improvement in the health of their dogs’ very shortly after they added this probiotic to their diet. And, if you are unsatisfied for any reason, just contact the manufacturer and they will fully refund your money. Conclusion: Overall, we feel that PetVitality Pro Probiotics for Dogs with Natural Digestive Enzymes is a high-quality product that offers very effective results. However, if you would like a product that is made in the USA, you might want to consider one of the other options mentioned on our list. 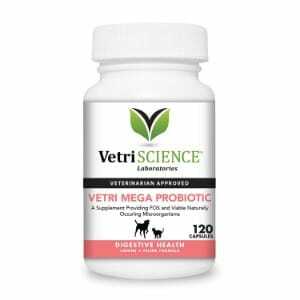 To round out our list of the best dog probiotics is VetriScience Laboratories Probiotics for Dogs. Like the other dog probiotics on our list, this product is designed to support the overall health and well being of your pup, with the primary emphasis being on the health of his digestive system. The VetriScience Laboratories Probiotics for Dogs is comprised of a total of eight strains of 5 billion micro-organisms in each capsule, which is a very healthy dose. All of the microorganisms are derived from non-dairy sources, so if your pup has a sensitivity to milk, than you don’t have to worry about this product causing any adverse effects. This formula is administered in capsules. You can choose to give a capsule to your pup before or after a meal, disguise it with a treat, or open up a capsule and sprinkle it into his food. The formula is supposed to be tasteless, so your pup shouldn’t have any options with taking this down. These probiotics are recommended by vets for dogs that suffer from digestive issues, such as diarrhea, flatulence, and constipation, as well as those who are prone to food sensitivities. The good bacteria found in this best probiotic for dogs include lactobacilli, bifodobacteria, streptococcus thermophilus, and fructooligosaccharides, among others. Overall, users are extremely pleased with VetriScience Laboratories Probiotics for Dogs. Most people claim that they noticed a marked improvement in their pets’ digestive health soon after they started offering this probiotic. Conclusion: Our panel of experts has concluded that VetriSicence Laboratory’s Probiotics for Dogs offers high-quality healthy gut flora for dogs and will help to promote his overall health; specifically his digestive tract. You love your dog more than anything in the world and you want to ensure that you are providing him with the very best of care. To ensure that he is happy and healthy, you have spent a tremendous amount of time researching all of the different products that are on the market for dogs. You’ve chosen the best dog crate, dog bed, dog house, outdoor dog kennel, and even the best dog playpen to meet his needs. In terms of his health, you have also put a lot of thought into the food that you feed him. You’ve picked out the best dog food to support his nutritional needs, whether it’s a low protein dog food, a dog food for sensitive stomachs, or an organic dog food, and you’ve also picked out the best dog bowl so that he can thoroughly enjoy your meal. But if you really want to step up your pet’s health or if your pooch is exhibiting digestive health issues, than you might want to consider adding a probiotic to his diet. If you’ve never used probiotics for dogs, you might be wondering exactly what probiotics are, how they can benefit your pup, and what features the best probiotics for dogs offer. Below, we provide valuable information about dog probiotics so that you can make the best choice for the health of your furry best friend. Basically, probiotics are made up of live bacteria that improve the health of your pup; specifically the health of his digestive system. While you might think of bacteria as being bad for your dog, there are actually good bacteria that offer numerous health benefits. Probiotics have been proven to be an effective way to improve the digestive health of dogs, especially those that are suffering from issues with their gastrointestinal system. For example, if your pup suffers from diarrhea or flatulence, probiotics can help to ease his symptoms. But that’s not all probiotics do. They can also help to strengthen your pup’s immune system, ease allergies, and just improve his overall health and well being. Improved gastrointestinal health. Probiotics can help to reduce the frequency and duration of symptoms that affect the gastrointestinal tract, such as diarrhea, constipation, and flatulence. Improved digestion. The healthy flora that probiotics offer can help your dog get more out of the premium quality food that you are feeding him, as he will be able to absorb nutrients better. Stronger skin and coat. Probiotics can also help to improve your pup’s skin and coat, especially if he suffers from allergies. Strengthened immune system. It has also been found that probiotics can help to strengthen a dog’s immune system, thus improving his ability to fight off infections. In other words, probiotics for dogs can significantly improve the overall health and well being of your canine companion. When it comes to the health and well being of your dog, choosing the best probiotic is absolutely essential. Unfortunately, there are a lot of products on the market that advertise they offer the best supplements, but in reality, they either do very little or worse, they can cause adverse effects. Bacillus coagulans, which coat the lining of the digestive tract in order to protect your pet from harmful bacteria that can make their way into his system. Bifidobacterium animalis, a naturally occurring bacterium that is found in the large intestine of a dog. This probiotic helps to improve your pup’s digestion and it also improve the functioning of his immune system. Bifidobacerium bifidum, another bacterium that can strengthen your pet’s immune system. It also helps to balance out the bacteria inside your pup’s stomach, ensuring that there is a healthy balance. Enterococcus faecium, which is another naturally occurring bacterium, and it’s found in the stomach of your dog. This probiotic aids in digestion and also ensures there is a good balance of bacteria in his stomach. Lactobacillus plantarum, which helps to improve unpleasant gastrointestinal symptoms, such as diarrhea. Easy application. It can be difficult to give some dogs probiotics; especially those that are very particular about their food. To ensure that your pup is ingesting the probiotics you are giving him, choose one that offers an easy application. A powder or a capsule that is served in a capsule and can be opened up is ideal, as you can disguise the probiotic in his food. A healthy amount of probiotics per serving. While there is no right or wrong amount of probiotics per serving that your dog should be receiving, to see optimal results, look for a product that offers somewhere between 2 and 6 billion per serving size. The amount of species. The more species of bacteria that are present in the probiotic, the more health benefits it is going to offer your dog. Whether your pet is suffering from digestive health issues or you simply want to improve his overall health and well being, than adding a high quality dog probitoc to his diet is a wise option to consider. It has been determined that the best probiotics for dogs can offer numerous benefits, including improved digestive health, a stronger immune system, allergy relief, and even healthier skin and coat. If you want to improve your pup’s health, choose a high-quality probotic, like one of the options recommended in our review.